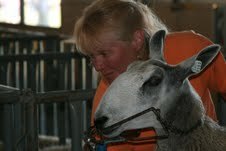 Deschutes County Fair(Oregon), held Aug 2-7, 2011. 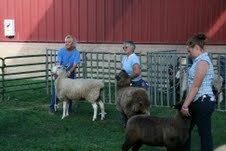 There were 12 champion rams in the class from long, medium and fine fleeced with both natural colored and whites represented. Theo won the Supreme Ram under judge Pat Arias from Manteca, California. Robina’s yearling BFL ewe also won reserve champion ewe overall. Smile, Robina, you’ve done well!